Bluetooth mobile ( Nokia new or used with Camera preffered. No limitation, send thousands of SMS daily. Use forever, no registration required. Capacity to send 5000 sms daily. 1. What if, it does'nt work after purchase? A. Your money is 100% safe, We will check it, if it will really not working with hardware requirements stated, then your 100% money will be refundable. You only pay if SMS sender send Messages. 2. Do you also provide any support, how to install and configure it? A. Yes, if required, complete support will be provided. 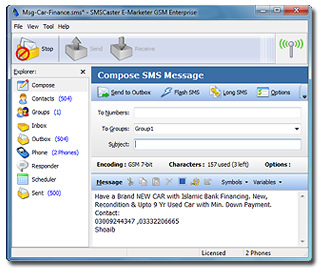 SMS sender is very easy to use. After bluetooth dongle is pluged into USB, Windows automatically install bluetooth driver, & SMS sender application auto detect port, and then it will ready to work. 3. Do you also provide any Guide, How to use it? A. Yes, pictures based, step by step guide will be provided with SMS caster, How to install and use it. Even a child can easily understand, how to use SMS Sender. 4. Can I purchase it with Easypaisa or Online banking? A. Yes, SMS sender can be purchased in any city of Pakistan with EasyPaisa or via Habib Metropolitan Bank Online Banking. When your payment is confirmed, We will send it to your Email address. Or Provide link from where you can Download Or you can buy it by visiting our office. Which method you like. Note: Commercial SMS Sender Supports 4 Mobiles and Costs: 2500/- Rs. If you want to start your own SMS Sending Business.